Notre Dame is one of the most iconic monuments in Paris, if not the world, and countless tourists and photographers have snapped photographs of the Gothic cathedral in the heart of France's capital. The devastating fire that erupted Monday claimed Notre Dame's spire and parts of its roof, though it spared the huge bell towers that face out onto the place du Parvis-Notre-Dame, the point from which all French roads are measured. Below, compare pictures of the landmark at its pomp with ones showing it during and after the blaze. Left: Satellite imagery shows the Notre Dame cathedral from above. Right: Drone imagery taken on April 17, 2019, shows the extent of the damage done by a fire that broke out on the famed cathedral in Paris, France. Left: Tourists wait to enter the Notre Dame cathedral on Aug. 8, 2018. Right: Fire breaks out at the Notre Dame cathedral on April 15, 2019. Left: The Notre Dame cathedral seen in an 1987 photo. Right: A fire breaks out at the Notre Dame on April 15, 2019. Left: The Notre Dame cathedral seen on March 27, 2019. Right: The spire of the Notre Dame is engulfed in flames on April 15, 2019, moments before it collapsed. Left: Notre Dame's iconic spire is seen in a snowy Paris on Feb. 7, 2018. Right: The steeple and spire of the Notre Dame collapses shortly after a blaze broke out on the Notre Dame cathedral on April 15, 2019. Left: The interior of the Notre Dame as seen on Aug. 20, 2017, during a mass dedicated to victims of recent terror attacks and natural disasters across the world. Right: Fallen debris from the burnt out roof structure sits near the altar inside the Notre Dame cathedral, April 16, 2019. Left: The Archbishop of Paris, Andre Vingt-Trois, says mass at the Notre Dame cathedral on Nov. 15, 2015. 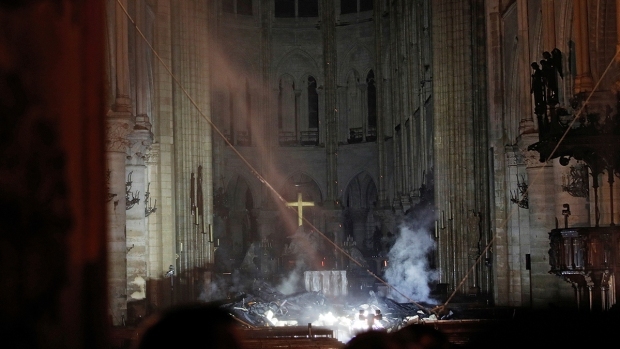 Right: Fallen debris from the burnt out roof structure sits near the high altar inside Notre Dame cathedral on April 16, 2019. 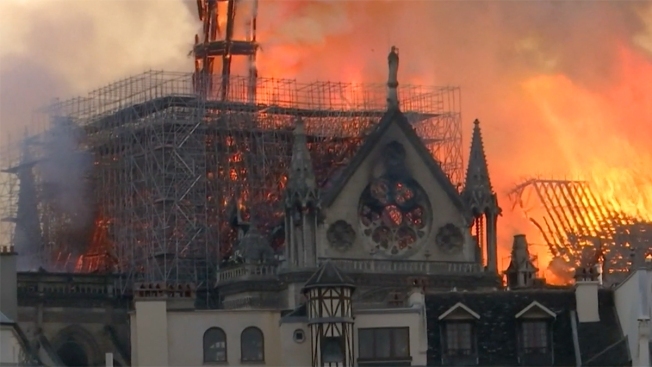 Left: The spire of the Notre Dame burns during an hours-long blaze on April 15, 2019. Right: The Notre Dame seen the morning after a massive fire burned down its spire and parts of the cathedral on April 16, 2019.